Victoria, Mahe (Seychelles) – July 2, 2018 (travelindex.com) – The months of June and July are being marked with a number of invitations for Saint Ange Tourism Consultancy to travel on a number of working missions, that will take me to five mainland African Countries, to undertake assignments alongside Tourism Ministries and their Promotional Boards or Private Sector Organisations and other tourism related bodies. I started this five-country mission last week in Addis in Ethiopia, before travelling on to the Democratic Republic of Congo (DRC). During the months of July and August, I will again be on the road travelling to Ghana, Kenya and South Africa. In Addis, among different meetings held, I also completed a successful working session with a group of Private Sector entrepreneurs who had come together to ensure their businesses remain relevant in Ethiopia’s Tourism Industry. We discussed their visibility and how to increase it to ensure relevance. We discussed key USPs and the need to use their destination’s strengths in their own drive. Last Friday night in Kinshasa in the DRC, I took to the podium at the launch of the tourism book “Opportunities of Investments in Tourism” published by former Tourism Minister Elvis Mutiri wa Bashara through the European Universities Editions, and will also be involved in different meetings in the coming days. After my term of office as Minister for Tourism, Civil Aviation, Ports and Marine of the Seychelles, I launched my own tourism “Saint Ange Consultancy”. A year ago, after missing out on the position of Secretary General at the UNWTO (United Nations World Tourism Organisation), when Seychelles under pressure of the African Union (AU) withdrew the island’s candidature. Today, I am regularly called upon as a speaker at tourism conferences and sit as a panelist at different industry conferences. I am also responsible for the weekly “Saint Ange Tourism Report” that is re-posted on most of the important tourism news wire right across the world. I am proud to say that I was the First President of the Indian Ocean Vanilla Islands and I am today the President of the Seychelles Labor Union (SLU), Deputy Secretary General of FORSEAA (Forum of Small Medium Economic AFRICA ASEAN) based in Jakarta Indonesia, listed as a Consultant for TMN (Travel Marketing Network) in New York USA, Co-Chair of the SUNx (Strong Universal Network) Organisation in London UK, Vice President & Founding Member of ICTP (International Coalition of Tourism Partners) and a Member of the Advisory Board of the non-profit organisation “Helping Needy Welfare Society of India”. On the 29th June 1976 Seychelles became an Independent Nation and ended the electoral call of the era for sovereignty and Nationhood. In 2018, 42 years later the call for self determination for Seychelles, and this by Seychellois for the whole of its territory. Independence for Seychelles from Great Britain saw the return of the three islands of Aldabra, Farquhar and Desroches that had been detached some ten years earlier (1965) to form the new British Indian Overseas Territory (BIOT) together with an island belonging to Mauritius that was all administered from Seychelles by the British Governor of the time. The loss of these islands caused a lot of frustration and saw a lot of protests by Seychellois who loved their territory. Seychellois must safeguard today what is theirs and they must work together to protect the sovereignty of their territory in its entirety. The People of Seychelles were active on social media as the islands marked the anniversary of its Independence from Great Britain. We are posting a historical news clip of that important event of 29th June 1976 to remind ourselves of the day we became an Independent Nation. On the 29th June, Seychelles celebrated its Independence Day anniversary. This was also the anniversary of the return of its three islands of Aldabra, Farquhar and Desroches, which had been transferred from Seychelles in November 1965 to form part of the new British Indian Ocean Territory (BIOT). During this same week of June 2018, news broke from India that Seychelles could now lose its Assumption Island, in what is being called “India’s drive for a strategic advantage in the Indian Ocean Region”. Seychelles President Danny Faure was on a six-day official visit to India and from New Delhi on June 25. It was reported that:- “India and Seychelles today agreed to work together on a project to develop a naval base at the Assumption Island keeping each other’s concerns in mind after talks between Prime Minister Narendra Modi and President Danny Faure. India also announced a USD 100-million credit to Seychelles for augmenting its defence capabilities. “With this credit, Seychelles will be able to buy defence equipment to boost its maritime capacity,” Prime Minister Modi said in his joint media statement with Faure. On the project to develop a naval facility at the island, which would give India a strategic advantage in the Indian Ocean Region, Modi said, “We have agreed to work together on the Assumption Island project based on each other’s rights.” Faure, in his remarks, said the Assumption Island project was discussed and the two countries equally engaged to work together bearing each other’s interests”. These declarations are contrary to all that Seychelles had been assured. The Indian Military Base was deemed dead after the last Press Conference chaired by President Danny Faure. The island’s National Assembly had confirmed on its part that this proposed deal would not be entertained in the Legislature. Seychelles was told that its concerns about the closeness of Assumption Island to the UNESCO World Heritage Site of Aldabra had been noted, and the objection for an Indian Military base raised by the Seychellois had been heard. 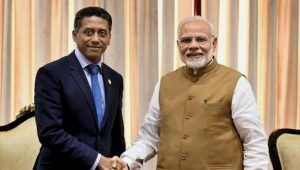 The visit by President Danny Faure in India has dealt another blow to every peace loving Seychellois with the Assumption Island affair, as India seeks a strategic advantage in the Indian Ocean Region. It is now the People of Seychelles as a whole who will need to work as one to save their island of Assumption and their UNESCO World heritage Site of Aldabra. The announcement that the EU’s flagship GCCA programme was investing €2m in building sea defences to protect beaches and hotels on the island of La Digue in Seychelles brought many reactions from environmentalists and Diguois. The island is suffering from Sand erosion at Anse Reunion, and the EU will now be investing Euro 2million to try to mitigate this de-stabilising phenomenon, which is partly man made. For the last couple of years, the sand from Anse Reunion moves north, goes into the harbour, then dredged out to keep the harbour deep. The sand is then sold to the various building projects as fill, instead of being returned to the southern end of Anse Reunion to start it’s cycle again. Sand movement is a natural phenomenon and if sand is just taken out, La Digue will end up being an island surrounded by a wall. The laws or regulations of Seychelles stops the removal of sand from its beaches, but on La Digue, under the watchful eye of the State, sand is not only removed by tons, but used for purposes that the laws or regulations were made to stop. Today the EU will step in and spend Euro 2 million to try to mitigate what we are doing by ourselves to destroy the beauty of La Digue. In our edition of the Saint Ange Tourism Report last week we published the proposed involvement and financial support of the European Union (EU) which brought a lot feedback and all pointing the finger to the Government’s removal of sand as the source of problems La Digue was today facing.